Don't settle for a cove or low tide mud flat. Traveling this far you want deep water, open ocean as your view and beach. A nature lover's paradise, this secluded house has breathtaking views overlooking deep ocean and islands of Little Kennebec Bay. A minute down the beach path to the ocean, no mud flats during low tide here. Nothing but ocean, ocean, ocean. Eleven miles from the college town of Machias, where theater and concerts provide a summer evening's entertainment, the short drive through Machiasport and Starboard offers the charm of Down East Maine's communities. Stop at the BBS Lobster Co. -Lobster Trap- in Bucks Harbor for the catch of the day and don't forget to make a blueberry pie, or buy one at Helen's Restaurant. Relax on the spacious deck to enjoy the birds, watch an eagle soaring overhead or paint the colorful sunset. Stroll down the pine and birch laden path to the nearly 400 feet of bold ocean shore to see the lobster boats, spot a seal or bask in the sun with a picnic. 44 acres of mixed forest provide seclusion for peaceful days and relaxing nights. The spacious, sunlit rooms offer quiet comfort to our guests. The skylights in master bedroom and living room provide sundrenched mornings and romantic starry nights! Queen bed room with comfortable sitting area and skylights. Twin bed room with spaceous closets that hold extra cots. Chair and a half opens up to a comfortable twin bed. Natural wood floors enhance the brightness of this seaside home. Fully equipted kitchen has everything from coffee grinder to basic food items to get you started in meal making. (Help yourself!) Glasses, dishes, pots, pans and all you'll need to boil your lobsters and pick them apart. Delicious! To the North: Eastport - quaint fishing village with antique shops, galleries, and the famous Raye's Mustard House. Have lunch and remember to bring some goodies back home. Lubec - cross to Canada on Campobello Island (don't forget your passports or photo ID), summer home of FDR, and visit the other side of the Island to the East Quoddy lighthouse. You may see pods of whales from the shore. West Quoddy State Park - picnic and hike along the high cliffs of the coast. Great views of Grand Mannan Island (Canada). Cutler - working harbor village with several Maine Coast Heritage Trails to hike along the Bold Coast. Make a reservation for a boat trip to see arctic terns and puffins in their nesting habitates on Machias Seal Island. Seals and whales are likely to join you as you travel. Machias - annual Wild Blueberry Festival in August complete with children's parade, craft fair, 5K run, and blueberry pie eating contest that fills this week long event. Starboard Community Club's annual lobster roll/fish chowder dinner the end of July. Machiasport Historical Society Museum, Margaretta's Days that celebrate winning the first naval battle of the Revolutionary War right in the Michias River.Their lobster lunch is a MUST. Milbridge - movie theater and ice cream parlor open in summer. Jonesport, Beals Island - hike the Maine Coast Conservancy of the Great Waas Island. Drive further south to Frenchman's Bay and visit Winter Harbor, Corea and Schoodic Point (part of Acadia National Park). And of course the most visited national park in the East, Acadia a 2 hour drive south. Take a mail boat ride to the Cranberry Islands or Swans Island, visit Bar Harbor and Northeast Harbor. Carriage paths to bike, horse trails to ride, and mountains to hike for all abilities. So much to do... more to check out in the notebook at the house. Cleaning services available upon request. Rental fees will be identified when the lease is emailed and may differ from what VRBO is suggesting. All rentals have a $100 refundable security deposit, and 9% ME state tax. 11 miles is Machias where there is Hanaford grocery, Rite Aid pharmacy, Whole Life- natural foods, Farmers market Fridays, several restaurants, and shops. Walk down the path to our cobble stone beach, watch the lobster boats, Eagles and maybe spot a seal. Find sea glass and follow the rocks around the Point of Maine. We so enjoyed your slice of heaven. It was just what we were looking for. Beautiful view and beach. So private and relaxing. We hope to go again next year. It was so quiet & peaceful !! The beach & ocean was so mesmerizing !! Every day & every tide was a new experience. The house was far beyond what we expected. We felt as though the owners were truely extending their hospitality to us. Would we do it again, in a heart beat. Would we rcommend this vacation home, absolutely !! The house is fantastic. It is very clean, has stunning views, and it’s own beach. It was secluded and private. Just what our family was looking for! There is much to do in the area, but make sure to get some live lobsters at the Lobster Trap and some blueberry pie at Helen’s! Thanks for your reservation. Glad you enjoyed your stay!! Outstanding hosts. Dramatic coastline, enchanted path to the shore and a quiet "away from it all" cottage that felt like home the minute we walked in. What a wonderful place. The house is gorgeous, much better than the pictures show, and very cozy. The ocean views from the deck are to die for. This is what post cards are made from. Having morning coffee watching the lobster boats and listening to all the birds and squirrels is heavenly. The rocky coast is a great hike, and holds all sorts of treasures to find. Easy day trip to Acadia and Canada, plus wonderful people in town as well. Did I mention quiet? It is very secluded but easy to find. We have been here a week, and havent heard anything other than ocean and wildlife yet. Lots to see, lots to do. And if you're lucky you can see Eagles, deer, chipmunks, badger, and a whole host of other creatures. We will definitely be back as long as the gracious hosts keep renting it out. They are quick to respond, and very friendly and helpful. Thanks for a perfect vacation. Fourth Visit--As Good As It Gets! This was our fourth vacation at this property and our two-week stay was perfect. We took full advantage of local events (Machias Wild Blueberry Festival, Machiasport Lobster Lunch, etc) and the hospitality of the community. The secluded location is a plus for us--quality time on the deck overlooking the water, beautiful views, wildlife and birds (bald eagles! ), and great hiking trails within a few miles of the house. The property is well-cared-for and complete with everything we needed for a great break from the usual hustle and bustle. A big "thank you" to our hosts for making us want to return again and again. St, Andrews, St. Stephens, birth certificates, passports, photo ID required. 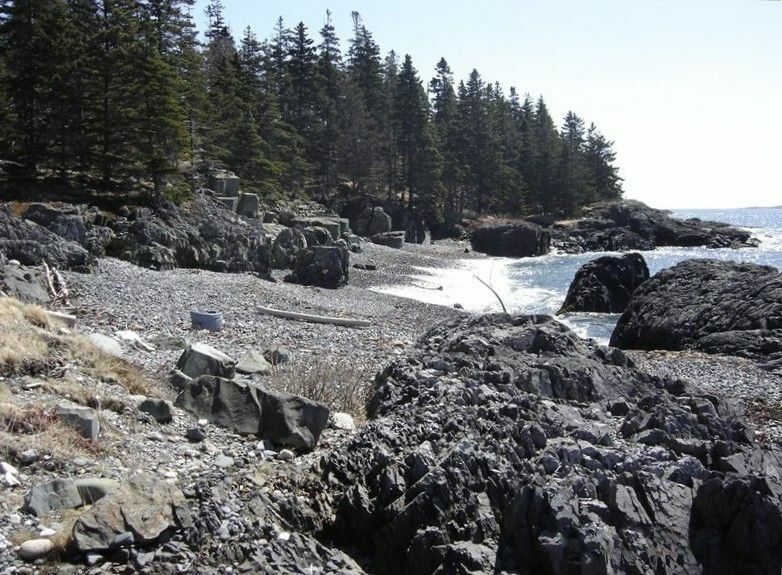 Cutler - Hiking trails along the Bold Coast,take nature boat tours to Machias Seal Island nature conservancy to observe puffin and arctic tern habitates, see whales and seals as you travel. Thousand-year-old Indian petroglyphs, working harbor. Eastport - Old Sow Whirlpool, Passamaquoddy Indian Festival in August, Eastport Wind Jammer's whale watching and sunset cruises, Salmon Festival in September and the largest 4th of July celebration in Maine. Get to town early for best views along Main Street! Don't miss a visit to RAYE'S Mustard House for lunch and some gifts! Calais - St. Croix Island Historic Site, State Cinema International Festival 1st week in August, Downeast Heritage Museum and Moosehorn National Wildlife Refuge on Rt. 1.